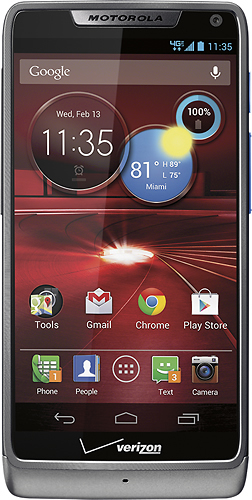 Best Buy appears to be selling a special edition DROID RAZR M in a Platinum colorway that Verizon is not offering. This new look turns one of our favorite mid-range (our review) devices into a grey and blue-accented beauty. The blue comes via the lock switch and volume rocker, though nothing else appears to sport this new color. We don’t have a picture of the back, so we’ll assume it’s the same as the kevlar backing on the white and black versions. If you want to pick up this special edition colorway, Best Buy is selling it for $50 on contract.